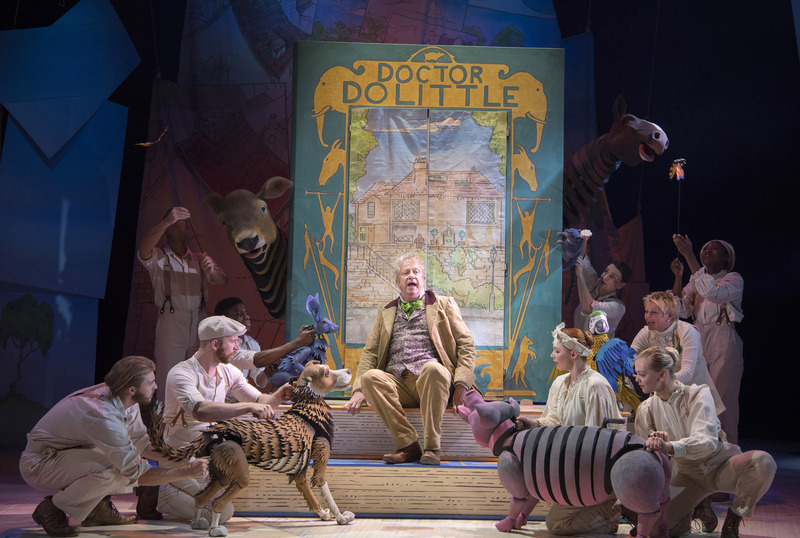 Dr Dolittle opened its national tour at the Churchill Theatre this week. Based on the book and the 1967 film this is very much a retelling of the traditional story for the modern audience. Dr Dolittle tells the story of a man who, with the help of his parrot Polynesia, learns how to talk to the animals. He soon receives a call for help to save the great Pink Sea Snail and with the help of a Pushmi-Pullyu he raises the funds to make the trip possible. However when he arrives it turns out all isn’t as it seems. This production is wonderful for many reasons but number one on this list is the puppetry. 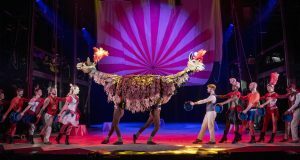 From the rabbits that bounce around the stage to the huge pink sea snail and from the dancing Pushmi-Pullyu to the life-life dog, Kip each puppet is made and handled with a huge amount of care and attention to detail. The ensemble are charged most of the time with bringing these puppets to life and they do so beautifully, ensuring that the puppets rather than the actors are always the centre of attention. The highlights of the show for me where the scenes where he puppets took centre stage as it really took the audience away into a world where animals really could talk. By contrast the scenes where the puppets weren’t featured as heavily could drag slightly and Act 1 dragged a lot more than Act 2 whilst they were preparing for the journey. The humans therefore have a lot to live up to when sharing the stage with the huge array of puppets. Playing Dr Dolittle was Mark Williams and he was utterly convincing as the man that could converse with animals easily but struggled with his own kind. He interacted with all of the puppets with ease and brought a real feeling of joy to the part. The love story of the show was between Dr Dolittle’s friend, Matthew Mugg, played by Patrick Sullivan and Dr Dolittle’s arch enemy’s niece, Emma Fairfax, played by Mollie Melia-Redgrave. They both had delightful musical theatre voices and their duet was the vocal highlight of the show. Adele Anderson played Lady Bellows and Poison Arrow. As Lady Bellows she was good fun but sadly the singing for Poison Arrow just seemed a bit too big for her and it came across as shouty instead. I also particularly enjoyed the choreography by Josh Rhodes who was able to choreograph a huge variety of numbers from an upbeat traditional musical theatre style number to a circus scene which included a dancing Pushmi-Pullyu. They all had a huge amount of energy and were danced very well by the ensemble. Dr Dolittle is a great show for the whole family to attend. A small word of warning if you are thinking of taking the little ones it is slightly on the long side at 2 hours 30 minutes (including the interval) although it certainty didn’t feel this long. The puppetry allowed me to become swept up into a world of imagination of talking animals at the same time as being taught a valuable lesson about how precious these animals actually are. Dr Dolittle is on at the Churchill Theastre until 24th November then it continues it’s tour across the country. To find out where it is visiting and buy tickets visit the website. If you like this review you might also like my review for Madagascar, Dirty Dancing and The Full Monty, all of which are touring the country at the moment.